With all the home improvements — actually, radical changes — that David has been working on, it’ll soon be time for a swag of before and after photos so you can ooohh and aaahh appropriately. David’s domain has been the house, but I’ve always managed the selection and planting of our garden and landscaping. 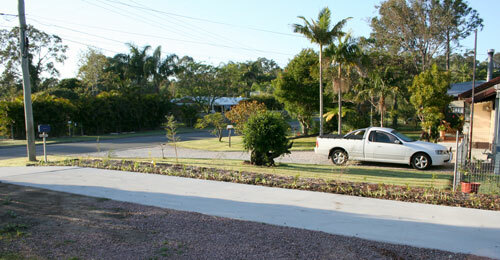 Here’s one of the garden I planted alongside our front driveway two years ago. 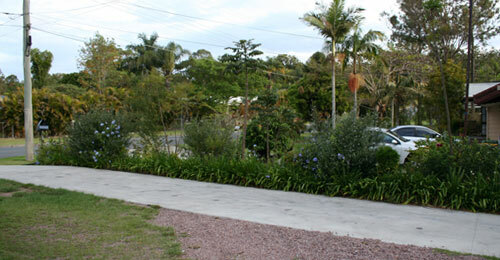 In October 2006, after we had the driveway put in, I planted agapanthus along the edge and shrubs in the middle — all chosen for their blue or white flowers. Two years later, and you can notice how the bushes have grown — some of them are almost six feet tall. The agapanthus is mature now, and we'll soon enjoy a straight line of blue fireworks. I am impatient for my garden to grow. Nearly every day I walk around, inspecting the plants and vegies, and of course nothing ever seems to grow quickly enough. But it is very encouraging to look back at the photos of when we put the plants in. They do say the best time to plant a tree is 20 years ago, and the next best time is today. By the way, cutting down that palm thing looked like hard work! Apparently our neighbour also has a new ute, but as it so closely resembles the previous model, I can’t tell the difference!